Dr. Stephen A. Isham was a practitioner in Spokane, Washington for many years, and then at the Coeur d’Alene Foot & Ankle Surgery Center from 1995 until his retirement in 2010. Dr. Isham devoted his career not only to practicing these techniques, but teaching MIS procedures at home and abroad. His influence is prominent in many Central American, South American, European and Asian countries. He has pioneered and published articles on many of the minimally invasive surgical procedures currently in use, and has received numerous honors worldwide for his work in this field. As in other surgical specialties, the trend in foot and ankle surgery is towards adopting minimally invasive (aka percutaneous minimal incision) techniques. Traditional or open surgical techniques are often performed in a hospital under general anesthesia and typically require large incisions and more aggressive techniques to effectively resolve the different pathological elements producing foot deformities. A major factor in recovery time and discomfort is the amount of tissue that has been involved by the incision and the risk of surgery is multiplied by general anesthesia. Minimally invasive surgery (MIS), allows for interventions to be carried out through extremely small skin incisions without direct exposure of the surgical field thus causing minimal injury to the adjacent tissues, thereby decreasing healing time and achieving the best cosmetic result. Radiographic (fluoroscopic) visualization is used during the procedure to guide the surgical maneuvers. Ambulatory foot surgery, in most instances, is performed in an office or an outpatient surgical center under local anesthesia meaning just the foot is numb but the patient is awake during the whole procedure. At the conclusion of the surgery, a few stitches may be used to close the opening and a small bandage protects the area. In many cases no stitches are required. The patient leaves the office walking, and in many instances in his own shoes! The condition has been corrected, the patient remains ambulatory and discomfort and prolonged disability have been minimized. Today, ambulatory foot surgery is a developed art. 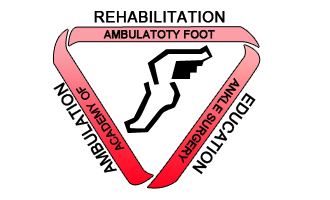 Over 2,000 international physicians and surgeons specializing in this technique are members of The Academy of Ambulatory Foot and Ankle Surgery, and with each year the number increases. The triangular academy seal depicts its dedication to ambulation, rehabilitation, and education. Ambulation – The patient who can walk into the surgeon’s office can walk out. Rehabilitation – Restoring the patient to good foot health without loss of productivity at the lowest possible cost. It is now over forty years since the original pioneers began the development of this art. They sought the means of ending discomfort and suffering for a wider cross section of the population. They reasoned that if the necessity for hospitalization and prolonged disability was eliminated, more people could afford to avail themselves of these advanced services. As their development progressed they found that it was rarely necessary to incapacitate their patients. Painful bunions, recurring corns, heel spurs, contracted toes and hammertoes were corrected by this new technique and the patients remained ambulatory. Through the years, other interested physicians and surgeons made worthwhile contributions until we have reached today’s state of the art. Cost effective, minimal invasive foot surgery is a reality. We hope this approach makes sense to you and we can start working together to correct your problems. Thank you for the time you’ve spent learning about us. Joining others in expressing appreciation for Dr. Isham’s work pioneering and establishing these minimally invasive surgical techniques worldwide, it is with our gratitude and in his honor that his work in is continued at the Coeur d’Alene Foot & Ankle Clinic and Surgery Center.